The main function of Congress is undoubtedly the power of the purse. To exercise that power, Congress has to adhere to a set of procedures designated in the Budget Act of 1974, and to enact 12 annual stand-alone spending bills. This has not happened in two decades; 1994 was the last time the process was completed. Instead the annual budget has become a battleground between the Administration and Congress. To avoid the severe effects of government shutdowns as a result of the failure to enact appropriations legislation, both the Legislative and Executive Branches tacitly agree to the regular use of continuing resolutions and omnibuses to complete their work on the annual budget. However, while these practices provide short-term solutions they create severe distortions in budget policy for the medium and long run. Implementing a biennial budget as part of a comprehensive budget reform might reduce the negative implications of CRs and omnibuses on the performance of agencies and Congress. Starting from the assumption that the authorization-appropriation model must be restored, a biennial budget could help restore fiscal discipline. We present different approaches to the biennial budget providing insights for Congress to consider, accounting for the effects of annual appropriations and two-year authorizations on budget projections from agencies, economic growth rates projections and public debt. Overall, instituting a biennial budget process represents a key element for restoring Congress’ authority as a counterbalance to the Executive, but also creating more incentives for the two Branches to enhance their cooperation. The annual battles over budgets, appropriations and threats of government shutdowns have become such a regular occurrence that the vast majority of those Members serving today have never actually seen the process work as designed by law. The last time all discretionary spending bills were enacted on time was in 1994 – over 20 years ago. The Speaker, Paul Ryan, was a 25-year-old junior staffer at the time. In the last four decades, the budget process has been dominated by continuing resolutions and omnibuses. Since these kinds of legislation are only supposed to be used to prevent the government from running out of money at the start of the fiscal year, they clearly represent a deviation from the standard authorization-appropriation process as established by the 1974 Budget Act. The use of these practices has become so chronic that it is the accepted way of doing business. These deviations from the intended mechanisms of oversight and appropriations, however, have greatly reduced Congress’ role in the budget process and eroded its responsibility to conduct oversight of the Executive Branch. That is because the extended use of CRs and omnibuses over time increased the power of party leadership in each Chamber, at the expense of committee chairs, who became less involved in negotiations with the Executive Branch and who saw their roles diminished in the budget process. If the President can negotiate directly with the Speaker over one big omnibus appropriation bill, then why should he also negotiate with individual Appropriations Committee members? The Administration also does not have any incentive to cooperate with Congress, unless it passes authorizing legislation, which is the opportunity for authorizing committees to hold the Executive Branch accountable. Setting aside the implications derived from the changes in the power structure within Congress, the practice of continuing resolutions and omnibuses also raise legitimate questions about whether the process used to pass such legislation is valid, especially when Congress has a limited time to debate, and almost no opportunity to amend, as an omnibus bill can appropriate more than a trillion dollars in spending. As a senior congressional staffer said in an interview, “CRs and omnibuses are not ideal but they are practical”. Practical or not, official data shows that in the last 18 fiscal years, Congress provided funding for the government through continuing resolutions covering an average of 5 months per fiscal year – almost half of every fiscal year. As the authorization-appropriation mechanism often does not function, and continuing resolutions covered almost half of a fiscal year, our Federal budget process has seemingly become an annual struggle to merely prevent government shutdowns rather than a substantive process designed to enact deliberate policy choices. Additionally, these omnibus bills often include legislative provisions, known as policy riders, which typically constitute violations of the Standing Rules of the House and Senate that prohibit legislating on a general appropriation bill. Unfortunately, both Chambers have means by which they can dispense with the rule against legislating on an appropriation bill with the use of waivers. In the House, a waiver is a provision in the special rule resolution drafted by the Rules Committee for the consideration of a bill; it suspends a House rule, meaning Members cannot object if the legislation or some action the Chamber does violates the rule in question. These special resolutions only require a simple majority to pass the House, so it is easy to waive the rule. The Senate will waive its rules either through a specific provision in a unanimous consent agreement, or when 60 or more Senators vote to overrule a point of order that a Senator has raised. A CRS report on “The Potential Impact on Agency Operations” of CRs mentions how Congress and the Executive negotiate the introduction of “anomalies” – provisions of law not allowed by the normal rules of legislating – to respond to what could be considered exceptional circumstances. For instance, a CR might remove a restriction on prohibiting an agency to start a new program or activity if the funds have not been appropriated in the previous fiscal year. These “anomalies” have been explained as necessary responses to urgent needs. However, if the authorizing process were conducted, carrying out the congressional oversight function, these gimmicks would not be needed. This would give a clear overview of each and every agency and program within a stand-alone authorization bill. In the absence of a reliable authorization process, Members will try to secure policy riders on omnibus appropriation bills, to achieve through the appropriations process, what it should have achieved through authorizing legislation. According to Robert Keith, author of Congressional Research Service (CRS) Examples of Legislative Provisions in Annual Appropriations Acts, the appropriation bills should not establish nor alter government initiatives; otherwise the funds for the government will be held up by disputes over controversial issues not directly related to the appropriation bill in question. However, each year Members try to enact authorization policy via “legislative provisions”, also called “riders”. There are two types of riders. One actually creates a new program, policy, agency, or something similar. The other, a “limitation provision”, tries to rollback a policy already enacted by withholding funding for something. Provisions that change policy are prohibited under the rules of both Chambers of Congress; both Chambers routinely ignore those rules. Amendments that strike the funding for a program, as long as they have no conditions, are technically in order, though their last-minute inclusion on an omnibus bill is often meant to derail the process or force through a provision that should have been considered as part of an orderly appropriation process. Despite being forbidden or unwelcome, riders slip into law through procedural loopholes, or because a point of order is not sustained by the Chair or the Chamber overturns the Chair’s judgment on the point of order, or because the Chambers waive the rules prohibiting them. Whatever the explanation, these workarounds are symptomatic of a budget system that does not work the way it was designed to. Consider how the impact of CRs on agencies has created a near-permanent state of uncertainty. Imagine the following scenario. An agency has to prepare its budget request, taking into account the mission, scope and the programs needed to implement their mandate. Usually, an agency assesses its budget priorities based on the previous year’s funding. For an agency to prepare a correct budget estimate before submitting it to the President, the Executive Branch’s Office of Management and Budget (OMB) prepares guidelines and bulletins to support the agencies in the drafting of the budget phase. But since most agencies are operating under continuing resolutions at the time of year they are preparing their budget requests, they often have little certainty as to what their current budget actually is, or will be, by the time an omnibus appropriation bill passes – if it ever passes. Most of the guidance issued by OMB to the agencies concerns the risk of miscalculating the funds available under an interim CR due to the often-complex formulas and apportionment applied to CRs. This is no way to intelligently design a budget. Consider how many CRs and omnibuses have been used. According to CRS reporting, from the fiscal year 1986 to 2016, 390 regular appropriations have been “enacted or covered by full-year continuing resolutions”. Out of this number, 43.6 percent have been enacted in omnibus measures and 6.9 percent have been enacted in other forms, but mainly through full-year continuing appropriations. In short, over the last 30 years, more than half of all appropriations have been passed after the start of the fiscal year they were meant to cover. The “fixes” Congress has come up with to deal with its structural inability to pass budgets on time, calls for certain reforms, which would naturally be considered by a bipartisan and bicameral Committee on Congressional Reform. Moving the start of the fiscal year to January 1 (see “Happy New Year: The Fiscal Year Should Start On January 1st”) and switching from annual budgets to a biennial one would be just two proposed measures for a comprehensive budget reform. The biennial budget approach is focused on passing a two-year budget plan at the beginning of each Congress. Building a budget for a two-year period would provide the time needed to once again pass the authorization bills before appropriating money from the Treasury. When Congress passes an authorization bill, it is “giving the Executive Branch permission to spend money on specified items if that money is appropriated. Usually, the authorization process is where most congressional oversight of the various Executive agencies occurs. On the other hand, a budget appropriation is the actual spending of money by Congress, supposedly only on the programs approved by the authorizing committees”. [i] If the authorizing committees also pass multi-year bills, but the actual appropriation is kept on an annual basis, it can increase effectiveness and efficiency. Not only would the appropriators fund programs that have been previously authorized, as required by House and Senate rules, the appropriations process could start earlier in the second year, and could respond to emergencies or exigencies that arise between the passage of multi-year authorizations. The concept of biennial budgeting is not a novelty. Different Presidents, such as Ronald Reagan, George H.W. Bush, Bill Clinton and George W. Bush, have supported it. In fact, the concept of the biennial budget was implemented at state level too. There are, however, different ways of interpreting the definition of the biennial budget. Although all advocates of the biennial budget agree on the idea of bienniums and congressional budgeting for two years, supporters differ on the sequencing of steps – i.e., whether appropriation or authorization would come first. Some highly respected budget experts believe the appropriations bills should cover two years. G. William Hoagland, Senior Vice-President of the Bipartisan Policy Center advocates passing two-year appropriation bills in the first year of a Congress, and exclusively focus on authorizations in the second year. This approach is known as the stretch-sessions. He believes in the need for authorization to ensure that Federal programs will be run properly and accomplish the goals assigned by Congress. Besides, Congress could always pass emergency or other urgent appropriations should some special circumstance come up. “If you’re spending all your time appropriating and budgeting, you’re not able to free up members’ time and attention to deal with the underlying authorization and oversight process,” Hoagland said. “It’s good governance.”[ii] In fact, in 2010, Speaker John Boehner proposed this and other significant budget reforms to President Obama in exchange for raising the debt ceiling. That was among the many opportunities missed when those talks broke down. There are different analyses showing the strengths and weaknesses of different biennial approaches. Some can be found in the CRS Report[iii] “Biennial Budgeting: Options, Issues, and Previous Congressional Action”. Supporters of the stretch-sessions say that the method increases time for Congress to authorize programs and agencies before it opens its purse to appropriate the funds. However, one drawback is related to budget projection. In an annual budget procedure, the time needed to project the revenues and expenditures and forecast is close to 18 months. In a biennial stretched approach the time will be 30 months. As economic projection is not an exact science, the differences between the economic projection and the actual economic performance could increase if the period used to project is longer. A ripple effect would be that future budgets and authorizations could rely on inexact data, which will result in incorrect assumptions and calculations which could create again the need to pass emergency resolutions just to avoid funding gaps, much less respond to an emergency situation such as sudden natural catastrophe[iv]. Another assumption that has been questioned about the stretch model is if the increased period of time for budgetary actions under this model would definitely lead to a decrease of missed deadlines of budgetary decisions. [v] In 1987, CBO expressed this uncertainty, also pointing out that the delays in the budget decisions were mainly related to the disagreements between the Executive and Legislative Branches, as well as between the House and the Senate. This approach is being used in 19 states. An analysis [vi]of biennial budgeting at the state level showed some improvements in the budget process, though one has to be careful since biennial budgeting implemented at State level may result in an apples-to-oranges comparison. States Governors, for instance, have a wide authority over the budget that the President does not have. For instance, in Iowa, Indiana, South Carolina and South Dakota, governors can transfer funds among the agencies without going through the legislature. Moreover, out of all the states that still have a biennial budget, only North Dakota and Wyoming enact an actual two-year budget as envisioned above, where the remaining of the states enact separate budgets for two fiscal years at once. [vii] The two states will pass a budget over an entire two-year period – for instance, July 1, 2017 to June 30, 2019. The other 17 states actually pass two individual budgets within one budget resolution, for instance July 1, 2017 to June 30, 2018 and July 1, 2018 to June 30, 2019. This makes it easier to modify the second year of the budget in an annual or emergency session, if economic assumptions change dramatically due to recession or emergency. Of course, in the case of a governor’s unlimited authority over budgets, choosing an annual or a biennial budget cannot provide much guidance for the Federal budget process, where the Constitution exclusively reserves the origination of all appropriations and revenue bills to Congress. Table 1 shows all the states with annual and biennial budgets. The case for a Federal biennial budget should not be considered only from the perspective offered to Congress to enhance its time management for budgeting. A biennial approach (with the authorization phase enacted in the first year of the biennium), could very well respond to two major challenges for Executive agencies: It will increase the certainty of their budget projections; and it would grant more time for Congress to request accountability, make changes, or even eliminate programs that do not work. In combination with changing the fiscal year to January 1, this approach would increase the Executive Branch’s accountability to Congress, as Government agencies would tend to be highly responsive to requests for congressional information if they knew their programs could be eliminated or curtailed in an authorization bill. Since under the two-year cycle, the passage of an authorization bill would become standard practice, not just a requirement that could easily be waived, the Administration would have to take the authorization and oversight process more seriously than it currently does – thus increasing Congress’ Article I authority over the Administration. Put differently imagine a program under a certain agency sunsets (expires) in the next two years. (Another major budget reform would include sunset provisions for all discretionary spending programs.) To renew or continue the program, the Administration would have to come before the authorizing committee and justify its continuation. This is extremely important. If Congress ignores authorization bills and only passes appropriation bills, that occurrence shifts from itself to the President the de facto power to determine whether outdated programs survive, since by rule, Congress is not supposed to make policy changes on appropriation bills and the lack of authorization removes any formal accountability to Congress. Another element to be considered is the biennial deadlock in annual authorization process caused by the two-year election cycle. Since there would be no need to wait for the President’s budget proposal, or for the passage of a budget resolution, the appropriators could start their process in January of the election year. This, and changing the fiscal year to a calendar year, avoids both a politically charged showdown the month before the election and the need to finish substantial business in a lame-duck session held after election, which allows retiring or defeated Members to make decisions without fearing voter backlash. Finally, if the process is spread out and made more orderly, it allows for the possibility of better and more predictable coordination between the Congress and the President. Obviously, the two have to want to work together and, importantly, be willing to share credit in order for the even the most perfectly devised system to work. There is no utopia, and whatever budget reform is developed in the next few years, it will likely need revising again in a couple of decades. But the biennial approach can address many of the procedural and chronological problems with Congress’ ability to fully meet its obligations under the Constitution, and adequately review and conduct oversight over a nearly $4 trillion budget. The notion of the stretch-approach biennial budget has been under consideration for some time, and bills based on this notion have already been introduced in Congress. There have been several attempts in the past couple of Congresses. Rep. Ribble (R-WI) introduced H.R 1869[viii] in 2013. This Congress (the 114th), former Rep. Whitfield (R-KY), along with cosponsors Rep. Stivers (R-OH) and Rep. DeFazio (D-OR), introduced H.R. 1456[ix]. Once again this Congress, Rep. Ribble (R-WI) introduced a bill on biennial budgeting, H.R. 1610[x], which 237 members cosponsored – a strong bipartisan majority. These bills have defined the term biennial as the period of two consecutive fiscal years beginning on October 1 of any odd-numbered year. However, besides defining the bienniums, each of these bills looked into the necessary changes for the budget process. H.R. 1869 would have established biennial authorization and appropriations processes, basically setting the authorization and appropriation for two-year time frame. These bills have been introduced with bipartisan support – overwhelmingly so in the case of H.R.1610. However, they did not advance, and it is interesting to observe why. All of these bills call for amendments to the current governing laws and procedures. The necessity of these reforms cannot be denied, as the deficiencies of the existing legislative process are an impediment to the enactment of the annual 12 stand-alone bills and a barrier to Congress actually passing a budget resolution. Why Not A “Stretch-Biennial Budget” Process? If the main focus, however, is to restore the budget process on an authorization-appropriation mechanism, the definition of the biennial approach could be changed in these bills. 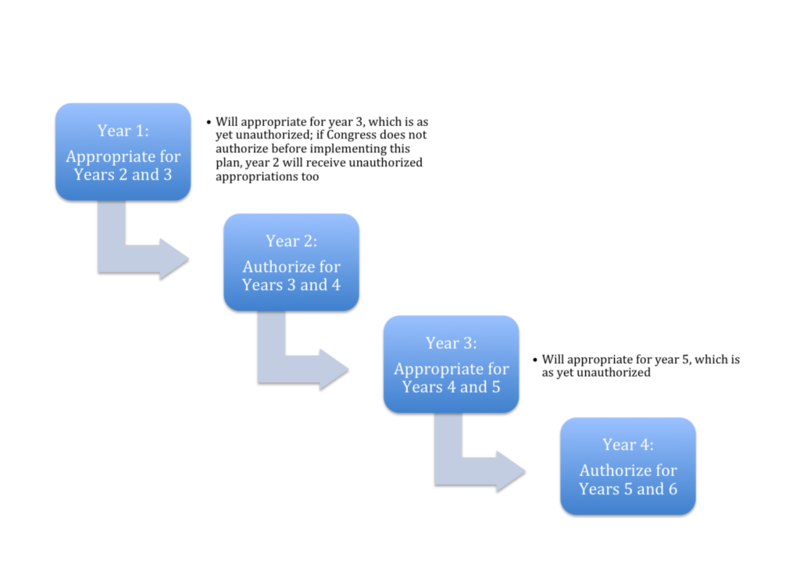 If the authorization phase will be focused on a two-year basis and the appropriation left on an annual basis, there could be multiple positive effects. The first one would be that the calendar for the authorization would be extended and the authorizers could have more time to exercise their oversight function. Additionally, the rationale behind a two-year authorization is focused on the role of the existing agencies and their scope. There will always be a need to have authorization for the Department of Defense, the Department of Homeland Security, Department of Justice and so on. Stretching the period for authorizing those Departments and Agencies to a reasonable timeline that can respond to the changes occurring in their respective fields is an incentive to efficiency. In this case, the appropriation of funds without authorization would be eliminated. In fact, Congress might want to codify the requirement that non-authorized agencies may not receive appropriations by making the prohibiting such appropriations non-waivable. Moreover, those Agencies and Departments will have to be more accountable to Congress, as they will have to make their case and persuade Congress to fund their programs and operations. As noted above, proponents of a matching biennial appropriation cycle, would allow the House to work on authorizations one year and appropriations the next, thus ensuring the authorization process in not given short-shrift. Though a two-year authorization cycle, backed up with a prohibition on waiving the rules against appropriating money to unauthorized programs should be sufficient, in and of itself, to restore Legislative-Executive accountability. A different approach is defining the biennial budget as a system starting with a two-year appropriation cycle, the stretch approach. The opposition to a two-year appropriation cycle is related to the risk of having to deal with overinflated budget proposals coming from the agencies, while the proponents of a two-year appropriations cycle, argue that Congress could always consider an emergency appropriation in the off-year. However, there are other significant problems a two-year appropriation cycle. One issue is that this biennial approach also has the potential to increase Executive Branch mischief by using its Executive authority to spend money without it being directly appropriated, just as President Obama has done. The House of Representatives has sued the Obama Administration for just such an offense, spending money for provisions of the Patient Protection Act not specifically appropriated by the Congress. The case of House of Representatives v. Burwell is working its way, successfully so far, through the Federal court system. In the most recent ruling, U.S. District Court Judge Rosemary M. Collyer wrote: “Congress is the only source for such an appropriation, and no public money can be spent without one.” If the House wins any appeal that the Administration may bring, the Courts will have made themselves the guardians of the prerogatives assigned to the House by the Constitution. If not, biennial appropriations become a greater risk to the Congress’ power. Another problem is that the beginning of the biennial budget will still have to rely on authorizations done in the previous year, which is to say, on the actions of the previous Congress. If we consider that the biennial budget will live long enough to survive at least one Congress, another consideration arises. Every second year of appropriation bill would be done in the absence of authorizations, unless Congress were to pass, and the President sign a three-year authorization bill for all discretionary agencies and departments in the year before the biennial budget goes into effect – a very unlikely scenario. For a graphical representation of the explanations presented, consider diagram 1. In view of the present failings in the system, Congress would have to confront the risks of significant revenue uncertainties in the second year appropriation (and the third year of the authorization). If the economy does not meet projected rates of growth, then the Federal expenditures will have to be covered either through unbudgeted higher taxes or by increasing the national debt beyond the amount approved in the biennial budget. In short, this alternative offers a host of potential problems that would threaten to undermine the new process before the first biennial budget cycle was complete. By contrast, the annual appropriation subsequent to a biennial authorization will reduce these risks, as the evaluations of economic performance will be made under the annual indicators. And appropriators can always reduce funding for marginal programs to help pay for urgent needs. Proponents of an annual appropriations process also argue that while authorizers look at the big picture and merits of large Federal programs, appropriators often need to react to unforeseen emergencies like floods, a cyberattack that brings down large sections of the electrical grid, terrorist attacks or even outbreaks of mosquito-borne illnesses. While the benefits of a biennial budget and authorization process are pretty clear to even a significant majority of the current Congress, the issue of whether to maintain the annual appropriations process, or switch to a biennial appropriation process that alternates years with the budget resolution and the authorization process is something best determined by Congress creating a bicameral and bipartisan Joint Committee on Congressional Reform. Under the proposed reform, with the agency being authorized for two years, the implementation of new programs, or even the expansion of an existing program, can be better guaranteed and accomplished in a more transparent and orderly way. At the same time an agency facing a two-year authorization that has an obsolete program must plead its case before the Congress in open hearings, or request that the program be changed or eliminated. Under the current practice, there are almost no programs eliminated, wasteful or otherwise, as the lack of an authorization process results in no clear oversight or requirements for the Administration to justify its programs before an authorization committee. As explained earlier, with the uncertainties brought by the regularized use of CRs and omnibuses, and the lack of genuine oversight through authorization hearings and bills, the ability to plan for the operations and programs of the Federal Government has become completely dysfunctional, which has weakened Congress’ constitutional responsibilities to hold the Executive Branch accountable for its use of the people’s tax dollars. It is imperative for Congress to reform its budget process in order to respond to the challenges of a massive $4 trillion-a-year budget (along with a $19 trillion national debt), the not necessarily inaccurate public perception of its lack of efficiency and accountability, and its constitutional responsibilities that have steadily been encroached upon by the President. The broken budget system perpetuated for over four decades has led to regular disruptions that undermined government effectiveness at all levels by increasing uncertainties and creating ambiguities often ham-handedly addressed with legislative anomalies and other budgetary tricks. The biennial approach maintains the two components of authorizations and appropriations, but changes the time frame to better ensure that both are implemented. As argued earlier, all budget reform must be considered in a comprehensive way that takes into account all aspects of the budget. No single measure can have a positive effect if it merely tinkers with procedural issues. The wide support that H.R.1610 should be considered a sign that Congress understands the need for reform and may be ready to finally begin a process that looks at all aspects of the way Congress does business. Amending the 1974 Budget Act and changing the House rules would be a step forward to introduce the biennial concept, which could actually increase the incentive for the Executive Branch to become more accountable in the process. The best way to approach a comprehensive reform that includes changing the date of the fiscal year, enacting a biennial budget process, enforcing rules that require authorizations to be passed before appropriations can be spent, sun-setting discretionary budget programs, eliminating baseline budgeting and many other ideas requires the enactment of a bipartisan and bicameral Joint Committee on Congressional Reform. This should be one of the major accomplishments of the 115th Congress, because as creative as congressional minds can be, they are running out of blue smoke and mirrors as a substitute for a rational, orderly and logical way to manage the largest government budget on earth. Mark Strand is the President of the Congressional Institute and Anca Butcaru is a research fellow. The Sausage Factory blog is a Congressional Institute project dedicated to explaining parliamentary procedure, Congressional politics, and other issues pertaining to the legislative branch. [iv] Young, Stuart, McLelland Drew, “Implementing Biennial Budget for the U.S. Congress”, Harvard Law School, Federal Budget Policy Seminar, Briefing Paper 20, June 6th, 2006. [vi] Snell, K., Ronald, “State Experiences With Annual And Biennial Budgeting”, April 2011.